It is amazing to me that we are in our tenth April, celebrating tattooed poets during National Poetry Month. We're launching this year's parade of poets with a special contribution from Rajiv Mohabir! "The square tattoo is in honor of my Aji, Gangadai Mohabir (my paternal grandmother) who mothered thirteen children in Guyana. It was a long-time tradition for people, and especially Bhojpuri women, to tattoos their husbands’ names on their forearms. There was a belief that people’s names held magic, that by using someone’s name you would disrespect them by giving their power away. My family’s naming traditions are mystical still, albeit changed somewhat. 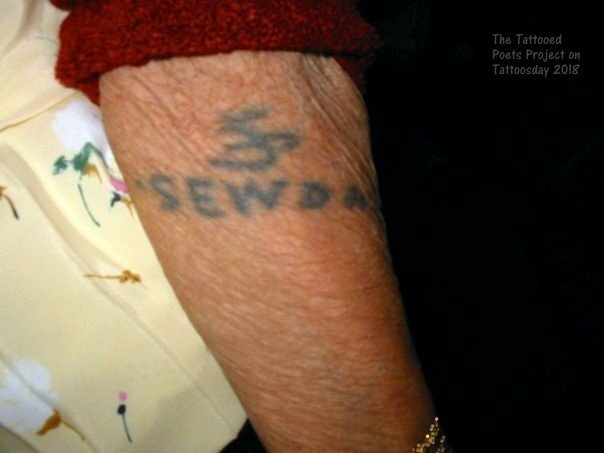 My Aji tattooed her husband’s name (Sewdass) on her arm with and Om above it, so when people asked who her husband was—which seldom happened in the small village of Crabwood Creek—she would be able to show them. My Aja did not have my Aji’s name tattooed on his arm though. Tattoos were thought to be important, signifying social standing. My tattoo is also in homage to this tradition of 'godna' and the Devanagari script says my ancestors’ names in four generations in the shape of a square. The names are Chandranarine, Sewdass, Mahabir, and Lachchman. 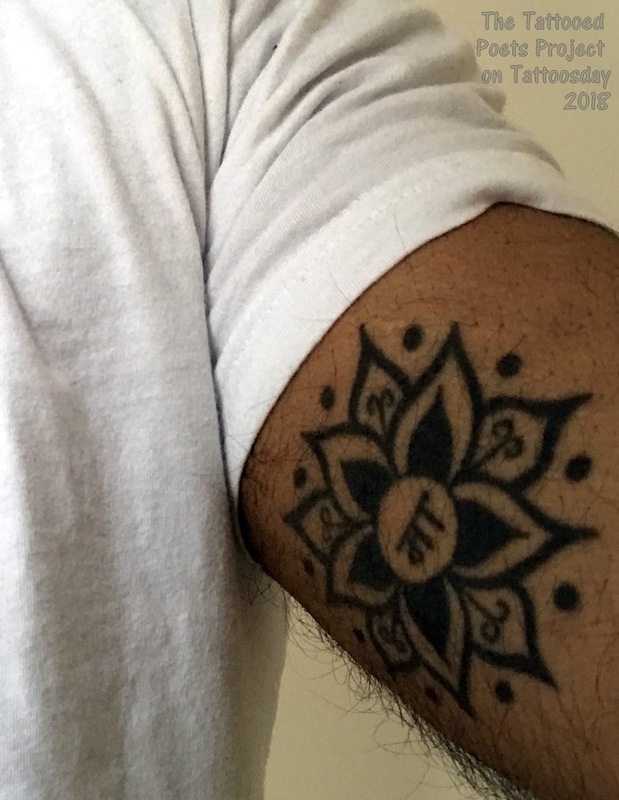 "Since this is so hetero-patriarchal and on my right arm (cosmologically significant for the masc energies of the body in Vedantic thought), I thought to balance out my energies by tattooing a lotus yantra with the word 'Ma' in the center to keep the women I descend from touching my heart. The left side of the body is believed to be the femme side. My mother was low-key offended that I didn’t have her on my arm. But I told her I have you all over my poems, which will exist longer than my skin. Did I mention that I’m a huge mama’s boy?" Rajiv Mohabir is the author of The Cowherd’s Son (Tupelo Press 2017, winner of the 2015 Kundiman Prize) and The Taxidermist’s Cut (Four Way Books 2016, winner of the Four Way Books Intro to Poetry Prize, Finalist for the Lambda Literary Award for Gay Poetry in 2017). In 2015 he was a winner of the AWP Intro Journals Award. His poetry appears and is forthcoming from journals like POETRY, New England Review, Kenyon Review, Quarterly West, and Prairie Schooner. He received his MFA in Poetry and Translation from at Queens College, CUNY and his PhD in English from the University of Hawai`i. Currently he is an Assistant Professor of poetry at Auburn University. To read more of his work, visit www.rajivmohabir.com. 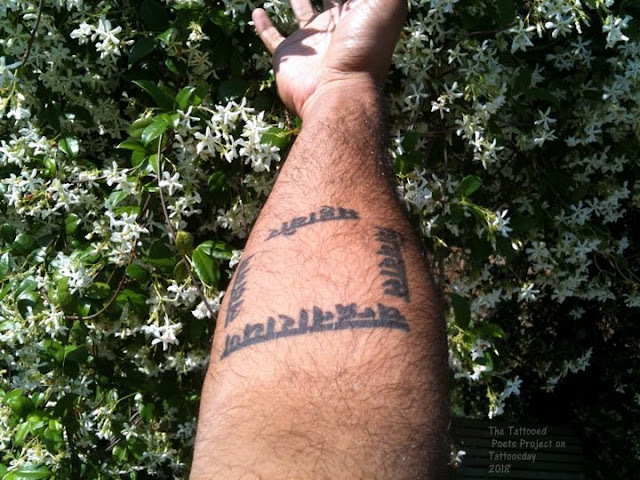 A hearty thank you to Rajiv for his contribution and his participation in the Tattooed Poets Project on Tattoosday! This entry is ©2018 Tattoosday. The poem and tattoos are reprinted with the poet's permission.